AMCOR Australia produce a range of packaging solutions, including large, lined and unlined bags for “bulk products” - used in the dairy and building industries. Conventional “pinch-top” versions of these bulk bags, where the top edge is simply folded over and sealed, are easy from an automation perspective, but produce a wedge shaped final package. When stacked on a shipping pallet these bags need to be overlapped in order to keep pallet layers flat. This limits the height to which they can be stacked on a shipping pallet, reducing stacking efficiency and increasing shipping and warehousing costs. The solution: the Maxipack concept. The Maxipack bag has a block-top (as well as a block-bottom). "Maxipack improves cubic utilisation by up to 15% – with corresponding savings in warehousing and shipping" explains Adrian Dalgleish, Maxipack's business manager. The design challenge for Maxipack was coming up with a sealer machine capable of folding a block-top in the top of the bag, and at an acceptable cycle time. 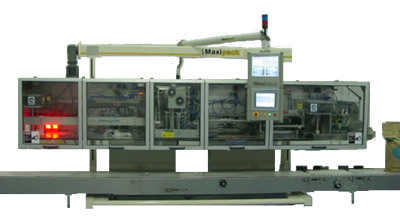 AMCOR contracted New Zealand machine builders Innopak Ltd to design and construct a bag-sealer capable of performing the complex task of folding and sealing the Maxipack. Vision User Interface showing Maxipack bag with vision tool overlay and graphical display of inspection data.. Given the complexity of the folding operations, control of quality of the seal is key. For this AMCOR and Innopak relied on ControlVision to come up with a machine vision solution that would integrate into the machine. The vision system would verify the correct assembly of every bag exiting the machine. The vision solution was based on a Cognex VisionPro integrated to Allen Bradley’s MicroLogix® PLC using OPC. Inspection images of each bag are stored allowing a "history" of bag fold information to be recalled at any time, or archived for quality tracking.